I’ve reviewed a handful of holsters here on TTAG, dabbling in many more that have yet to be mentioned. And to be honest, I feel somewhat remiss for not bringing this one to you sooner. 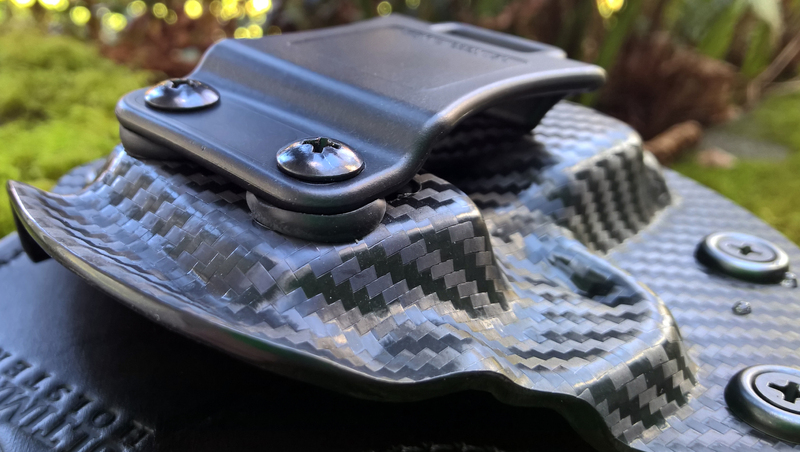 When I started using Ultimate Holsters gear eighteen months ago it quickly became – and still remains – the carry solution I fall back to once I’ve completed other holster review testing. Ultimate Holsters’ Cloud Tuck Rapid Holster and Ultimate IWB Spare Mag Pouch are hands-down the best hybrid holsters I’ve found for IWB carry of my sub-compact SIG P238 and mags. There’s so much to like about this small kit, I’m not even sure where to begin . . .
Now, from the moment I read the word “Ultimate” in their name, I was skeptical. Do you blame me? Yet, the second I pulled one of their holsters from its packaging, my dubiousness was dashed by the excellent craftsmanship and quality of components comprising the Cloud Tuck Rapid holster. It’s clear each holster is carefully hand-crafted to customer specifications. At first glance, the most prominent feature is probably the Kydex shell. I wasn’t a fan of the carbon fiber look until I had this holster in my hand, but I am now. The pattern really pops and its texture is true-to-life. What’s more, there are a total of five carbon fiber color options to choose from (above). And if carbon fiber isn’t your thing, the Cloud Tuck Rapid’s shell is also available in black, blood red, pink, and purple. Still not satisfied? Name your “custom infused” color at checkout. Most importantly, Ultimate Holsters uses precise firearm molds to create very accurate shells. My P238 has fit exceptionally well across all five shells I have used. Specific care is also taken to ensure proper engagement at the trigger guard, traditionally a critical area for retention. The Cloud Tuck Rapid’s Kydex shell is also quite trim, leading to a small footprint. Its edges are well-finished and smooth; a flared mouth at the top of the shell aides in re-holstering. As an added safety feature, Ultimate ensures the mold fills the space on the back side of the magazine release. Kydex in this space helps to keep the magazine from accidentally being released by blocking the button from somehow becoming depressed while holstered. Fastened to the shell below the Cloud Tuck Rapid’s open-throat sits a single, thick 1.5-inch wide, U.S.-made polymer belt clip. It has an aggressive barb that does a great job of locking around a host belt. The clip is adequately rigid and includes a handy integrated thumb tab to assist in removal. The clip also allows for a good degree of adjustability. Both cant and ride height can be easily adjusted to meet individual preferences (above). Rubber bushings help securely anchor the clip to the Kydex and also make ample room for thick belts and pants. While the Kydex half of the hybrid Cloud Tuck Rapid holster sure is nice, it’s the backer that is the true draw of Ultimate Holsters design – one that sets the brand apart from other hybrids. The holsters backer begins where most others end – with a piece of high-quality black leather. The leather backer then plays host to an industry first – a blue medical-grade, silver-infused soft antimicrobial pad. Glued and impeccably sewn to the leather backer, Ultimate Holster’s soft “Silver Lining” reduces odor, creates a moisture barrier between you and your gun, and promotes quick drying after use. The shape of the layered backer mostly follows the contours of the Kydex shell, extending above the wide mouth and clip to provide full protection between you and the firearm. Additionally, the backer is cut out around the P238’s safety, creating space to reduce the risk of an accidental snag. Ultimate Holsters boasts that their holsters are “constructed from the finest materials.” Not only are the backer’s layers, Kydex shell, and polymer clip top-notch components, the hardware holding it all together is also of excellent quality. The smooth brass washers, in particular, are nicely set into the backer to avoid snags and scratches. Adjusting the holster’s retention is simple with the four Phillip’s head screws and rubber washers. The four points allow you to make fine adjustments in specific areas, as opposed to a single point of adjustment. I found that the well-molded shells, combined with the hybrid backer, meant I didn’t need to crank-down on the rubber washers to attain the appropriate amount of on-body retention. In addition, the four screws are sized so that they never protruded past their brass washer counterparts. Wearing the Cloud Tuck Rapid holster is almost an experience too good to be true. Its rounded, smooth edges allow it to slip right in behind the waistline of your trousers or Bermuda shorts. Immediately you’ll notice how comfortable the holster feels – in any position. What’s more, the antimicrobial pad’s texture helps keep your shirt tucked in – a bonus I really like. And when it’s hot the holster feels great on bare skin and pulls any sweat away from your body. Important to a degree exceeding all other aspects of any holster is its functionality. Not only does the Cloud Tuck Rapid look great and feel awesome, it performs exceedingly well. Retention is reliable and draws are consistent and without hang-up on the shell or backer. My foremost concern with the leather/antimicrobial backer was that it would be too soft, compressing into the firearm and creating a “sticky draw”. However, the layered backer is rigid enough, and the leather dense enough, that only a very minimal break-in period should be needed, if at all. The “flop over factor” is very low with Ultimate Holsters. Again, the layers of the backer seem to work symbiotically to keep the backer from folding over the mouth of the holster. The no-flop backer, combined with the wide-mouth shell help facilitate consistently satisfying and dependable holstering of the weapon. The holster’s mouth is easy to visually identify and positive lock-up with the holster can be felt (and often heard) when attained. 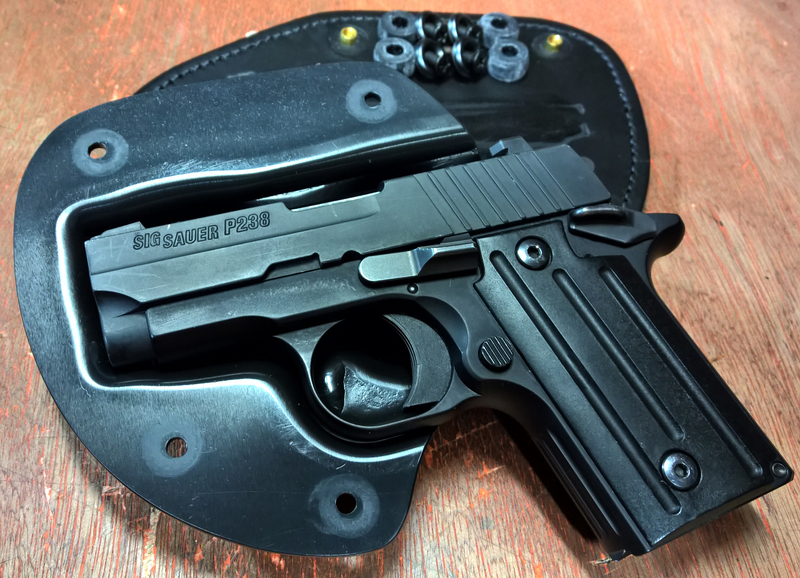 Now, the seven rounds in my SIG P238 aren’t exactly “high capacity” – or “standard capacity”, for that matter – so in addition to my Cloud Tuck Rapid holster I carry one or two spare magazines in Ultimate IWB Spare Mag Pouches. Ultimate’s Mag Pouches run the same line as the holsters – identical high-quality materials and craftsmanship resulting in a reliable and extremely comfortable magazine carrier. Made-to-order just like their holsters, Ultimate IWB Spare mag Pouches are optioned with bullets facing forward or rearwards. The Mag Pouch is also thin enough to be comfortably worn just about anywhere along the beltline. I routinely carry one at about the eight-o’clock position, as well as appendix – sometimes plural. They’ve retained my magazines perfectly, are easy to draw from and re-holster, and have the same great four-position rubber washer retention system. Ultimate’s holster and mag carriers are by far my favorite IWB carry set; especially when it comes to summertime carry (no undershirt) and carry when wearing a suit. In fact, wearing these holsters with a nice Canali suit felt pretty dang appropriate with the carbon fiber finish and leather. Another draw of Ultimate Holsters is their Ultimate Risk Free Guarantee. Essentially, you can try their holster for thirty days and if it doesn’t meet your needs, you can send it back for a full refund. If I could have tried every holster I’ve ever bought for thirty days, I’d probably have a few more firearms instead of a large drawer of holsters. Plus, they’ve got free shipping for order over $40 and their customer service is outstanding. So while I won’t go as far as to call anything the “ultimate” in its class, Ultimate Holsters’ Cloud Tuck Rapid IWB Holster and Spare Mag Pouch is the closest thing I’ve found so far. It’s hard to imagine a more comfortable hybrid holster that’s also this dependable – and adjustable, not to mention customizable, for that matter. The Silver Lining antimicrobial/antibacterial backer pad provides a real benefit and I’ve experienced miniscule delamination. Each holster is made-to-order and handcrafted with high quality materials that can take a beating. The Ultimate Holsters’ Cloud Tuck Rapid holster and Ultimate IWB Spare Mag Pouch look great, function great, and are lightweight…why wait? Great-looking minimalist design ensures a small footprint. High-quality components throughout. Excellent adjustability options. Very good fit across a variety of holsters. Shells molded with attention to critical areas of retention. Provides retention the way a holster is supposed to. Engages the firearm in the critical areas without creating too much friction. Wide mouth of holster allows for easy and safe holstering. The top-notch materials used in the holster hold up extremely well to wear. Expect years of service from this holster. This holster is finished as well as anyone could want; clearly hand-detailed. The stitching of the backers layers is near-perfect and the leather is very good grain – soft, yet dense, and well-stained. The Kydex used to create the shells is high-quality and the carbon fiber pattern is outstanding. Ultimate Holsters’ Cloud Tuck Rapid holster is highly comfortable, reliable, lightweight, and delivers a great fit, smooth draw and easy holstering. Handcrafted to order with high-quality materials, this holster can also take a beating. The Cloud Tuck Rapid’s antimicrobial pad simply can’t be beat. Designed to match Ultimate Holsters’ firearm holsters, the Spare Mag Pouch literally makes it a matching set. Utilizing the same minimalist approach as its counterpart, the carrier takes up little space and is very lightweight. Great adjustability. Very good fit to all magazines, regardless of capacity. Bullets facing forward or rearwards is a great must-have option. Includes standard four-position rubber washer adjustability to keep magazines engaged until needed. The top-notch materials used in the holster hold up extremely well to wear. Expect years of service from this mag carrier. The Mag Pouch is finished with a very high level of detail and care. Stitching of the backer is near-perfect and the leather is very good grain – soft, yet dense, and well-stained. The Kydex used to create the shells is high-quality and the carbon fiber pattern really pops. With quality mirroring their holsters, the Ultimate Holsters Ultimate IWB Spare Mag Pouch is a top-notch companion for the Cloud Tuck Rapid – or any holster, for that matter. I have not tried a Stealth Gear Ventcore holster…yet. They do look similar (don’t they all, though?). The main differences I see right away are the shape of the shell and, obviously the composition of the backer. Ultimate’s holsters have good quality leather and their backer is anti-microbial. Stealth Gear doesn’t use leather in their backers (which could be what some folks are looking for) and does not have the anti-microbial properties. The nice part about no leather is that I regularly wash my stealth gear IWB in the sink with hot soapy water and let it air dry. the belt clip is in the wrong location. this looks very nice. antimicrobial what? horsehide people. horsehide. Maybe I’m missing something. When I I hear/see the word tuck in a holster description my immediate picture is a holster where you can tuck your shirt in, better concealing your firearm. So, where does the tuck come in?